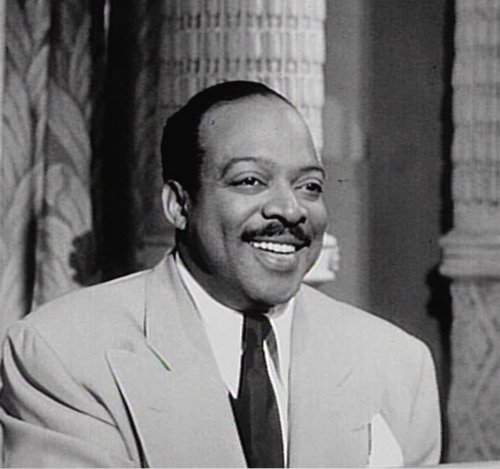 Count Basie was a professional jazz musician and big band leader for almost 50 years. His best-known themes included included "One O'Clock Jump" and "April In Paris". Here is a list of some of the popular songs Basie composed: "One O'Clock Jump", "Topsy", "Every Tub", "Swingin' The Blues", "Blues Backstage", "Eventide", "April In Paris", "Corner Pocket", "Shiny Stockings", "All Of Me", "The Second Time Around", "Li'l Ol Groovemaker...Basie! ", "Count Me In", "Doodle Oodle", "Li'l Darlin'", and "Broadway"
Count Basie at the piano. This is a screen capture from the movie "Rhythm and Blues Revue" (1955). Count Basie as he was featured on a United States Postal Service commemorative stamp issued in 1996.